Given the exposed position of Boundary Park on the side of the Pennines, revenge was always going to be rather chilly if dished out by the returning Paul Dickov. But with the cruel calamitous late own goal which booked Rovers’ place in the FA Cup third round, cold was certainly the order of the day. Dickov had consistently played down his desire to get one over on his former employers, who showed him the door despite a superb run in the FA Cup which saw giants Liverpool felled. And his sentiment continued in his post-game briefing as he described his delight at seeing familiar faces and his respect for the club which handed him his first managerial job. But there were a few signs that Dickov wanted desperately to give out a cheer that would echo around most of Greater Manchester. He strode proudly onto the pitch at full time and shook everyone’s hands, hugging several members of his own team. And there was the beaming grin he sported as he approached the gathered press half an hour after the final whistle. On top of any delight he felt at felling those who had dismissed him and sending home unhappy the Latics supporters who had called for his head, Dickov had plenty more to be pleased about. And he will have left his former workplace with plenty of confidence for what it is to come after seeing another strong performance from his side in bitterly cold conditions. There is no doubt that Rovers are on their most impressive run of performances this season, and perhaps for the last year. Dickov has talked long about his squad needing to settle into the season. And whether by happy accident or by long-considered design, Rovers certainly seem to be doing that. The football was not as breathlessly brilliant as it was at Rochdale a fortnight ago but there were patches of superb play. Considered possession play, quick passing, clever build-up. Would anyone dare mention anything about an O’Driscoll style? While Rovers gave their best attacking performance of the season in their dominance at Rochdale, what they produced at Oldham was more of an all-round show. There were times, particularly in the second half, when Oldham had the majority of possession. But the industrious nature of Rovers’ off the ball play ensured the hosts had few genuine sightings of goal. To a man, each Rovers player worked his respective socks off, be it in defence or launching quick attacks. Setting the brilliant standard was the tireless Theo Robinson. The centre of some stick for attacking performances lacking real bite, there can be no denying the workrate of the dedicated striker. He ran from the first whistle to the last, drawing defenders out of possession, but more notably tracking back and contributing more than his fair share of defensive effort. Robinson’s performance could only have been completed by a goal but he had the game’s best chance and was heavily involved in Rovers’ other best effort. 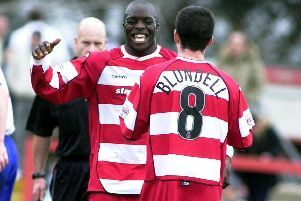 Other notable stand outs were Richie Wellens and Enda Stevens. And Wellens was again back to his best as the beating heart of Rovers’ forward play. He remains a surprisingly dynamic presence in the attacking midfield three alongside the ever-active James Coppinger and Kyle Bennett. It is no coincidence that Rovers have been at their most impressive as Wellens looks at his fittest. It was a game that could easily have gone either way. Oldham, in the main, had the greater of the possession but Rovers had the better of the chances. The visitors also looked to have more attacking intent when in possession, particularly in the first half. While not characterised by breathless goalmouth action, it was an enthralling spectacle, a well-balanced cup tie. Oldham looked every inch a side that had not lost in 12 matches on home soil. That Rovers were at very minimum their equal shows how much Doncaster have developed. They looked threatening from the start. Curtis Main clipped an effort over the bar in the first minute while Bennett could not get enough behind his shot after being worked into space on the edge of the box and Wabara stung Paddy Kenny’s hands with a rasping drive. Oldham settled into the game and began to control possession without showing any real urgency to get into the final third. And despite having less time on the ball, Rovers looked the more likely to score and probably should have done on the half hour with a lovely move. Wellens chested down a fine Paul Keegan cross, playing a neat one-two with Robinson as he did so but scuffed a shot straight at Kenny from eight yards. For their lack of real threat, Oldham really should have been in front eight minutes from the break from one of two chances in the same phase. First, Rovers’ JP Trophy winning final hero Jonathan Forte got in behind but was blocked out superbly by the on-rushing Sam Johnstone. And then, as Rovers failed to deal with the bouncing ball, Jabo Ibehre had space and time to turn and drill a shot which flew harmlessly over. Whether buoyed by the close chances or not, Oldham emerged much the brighter for the second half with Rovers initially appearing a little flat. A pair of headers from George Elokobi and Danny Philliskirk saw them threaten early before former Rovers trialist Philliskirk tested Johnstone’s reflexes with a driven strike from the corner of the box. While they were largely on the back foot in the second half, Rovers could feel deserving of their ultimate victory thanks to sheer effort off the ball. Space was closed down, bodies thrown in front of passes and shots. No one player could be accused of shirking responsibility. It took a while for them to really threaten again however but when they did, it was another superbly crafted move. Robinson collected a lovely lofted pass from Wellens, drilled inside to substitute Harry Forrester and claimed the ball again only to be denied by a fine low save from evergreen former Blade Kenny. Just when a replay seemed certain, Rovers were gifted the winner with a particularly unfortunate own goal on 87 minutes. Stevens beat his man out wide and drilled in a low cross which Kenny palmed away. How Dean Furman would have been wishing he had got the final touch to score against his former club as he charged after the ball alongside Genseric Kusunga. But the bobbling effort kicked up in front of the Oldham centre half and ricocheted in, despite Kenny’s attempts to hook the effort off the line. Oldham were denied an equaliser almost straight from the kick off when Johnstone produced a stunning save from a vicious strike. And although his bar was shaved with an ambitious, dipping effort from all of 40 yards, Johnstone and Rovers had deservedly secured their place in the third round where the big boys play. The revenge may have been cold, but Rovers’ prospects for the next six months are certainly heating up.